Our innovative, Quick-On forks install in seconds with no bolts, no drilling, no welding and no screw clamps to tighten. Capacity matched for your tractor. 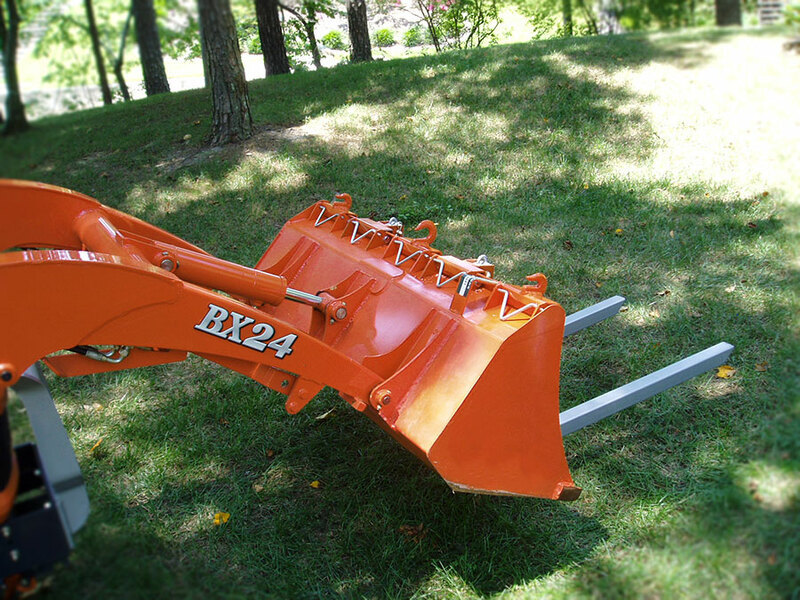 Plenty of strength but weigh less than 45 lbs per pair so they don’t consume your loader’s capacity. Forks are constructed of 2 inch square tubing gusseted for strength. Usable fork length is 36 inches. Other lengths are available. These forks pivot from the top like a commercial forklift forks making use on uneven surfaces much easier than rigid clamp-ons. Forks don’t turn sideways like clamp-ons. Position almost anywhere on the bucket except directly under the “Level Indicator”. Fork gussets do not intrude into the lifting area leaving a true 90 degree angle to avoid damage to boxes, appliances and square sided items. Tie down loop included at the top of each fork’s backstop to help with handling bulky or unstable items. Work great with our Quick-On Bucket Hooks for really clumsy stuff. 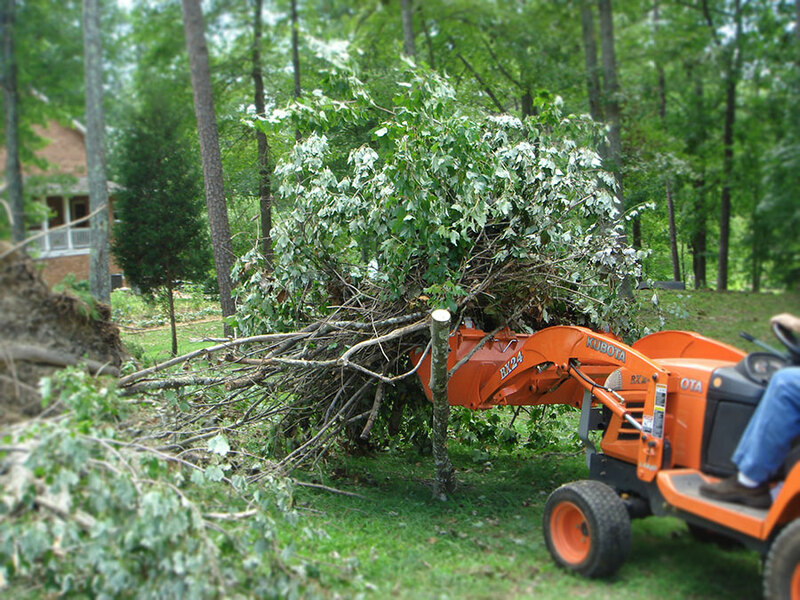 Great for storm cleanup, handling balled trees for planting, handling building materials, firewood, moving brush piles and debris, bucking logs for sawing and a variety of other uses. Light, compact and easy to store. Just hang ‘em on your garage wall. Quick-On brackets are orange. Forks are a tough hammered finish silver. Hardware is zinc plated. First off I must thank Harry for making a fine product again. I, like others had a bucket flange problem which wasn't Harry's fault. My bucket seems to be a BX25D bucket on a BX25 which has a different flange size. I sent Harry some pictures and the correct bucket flanges were here in a couple of days, and a pick-up label was sent for the incorrect ones. Problem solved very quickly by Harry and staff. I moved my large brush pile in two moves with the forks. Yesterday I purchased a box blade which was on a pallet and weighed 375#. The forks had no problem unloading my blade from my 1 ton dump. If you call BXpanded for anything, Harry and Kristen are there to help. You provide a great service for us BX owners. Thanks for all you do. The pallet forks and bucket hooks are great and are high quality, but what is even better is the OUTSTANDING service Harry provides. Like others, I also had trouble with my bucket sizing when my forks arrived. I was sure I measured correctly, but was wrong and that was my fault. I had a lot of problems getting them to stay on, but found a way to make them work. With these forks, I moved brush, logs and large stumps. The pile is more than 15%u2019 x 30%u2019 and as high as the bucket can reach. Harry has sent me the correct clamps & bucket hooks and even sent a label for return shipping! I will definitely recommend and continue to do business with Bxpanded! I bought a ~600 pound Amish-made outhouse for camp. Delivered to property on flat-bed, but how to get it to desired location? I took a chance sliding two forks beneath it; raised privy ~ 1 1/2: to 2" off ground, and slowly --marveling how GREAT it worked -- moved it several hundred feet to desired location. Oops -- needed a hole beneath it, so with forks moved it back; then, after a bit of bh digging, fork-assisted moving it back. WHAT AN INCREDIBLE TIME/LABOR SAVING ATTACHMENT!!! What an amazing product! No tools required! Pops on in half a second and stays in place! Got the forks out of the box on the machine in ten seconds... in 30 seconds i moved a pile of brush the size of the machine! Bon fire tonight!!! I purchased a set of forks for my BX 1870. I wasn’t sure what to expect after all these forks are small and lightweight compared to others. They also use the quick on connection. I was pleasantly surprised. Strong versatile attachment that works great for pallets and amazingly well with brush. Has saved me from a lot of back breaking brush handling. Worth the money without question. ONLY TRUE USE FORKS ON THE MARKET. I have used fork on many family owned tractors, but not like these! They truly work on BX-22. These forks worked like a charm, I had ten sheets of 3/4 treated plywood to unload from a trailer by myself. Could not have done it without BX25 and the forks that Harry and his crew made. Great investment. First off I ordered these online and unbelievably received them the next day and I live in GA. The forks are high quality with excellent welds and nice finish. I pretty much tossed the written directions and went and watched the online video and was able to install them in seconds out of the box. So far I used them to unload a 420lb brush mower that was shipped on a pallet (lifesaver) and can see lots of good uses for them in the future. I wouldn't use these with anything heavy unless you have the backhoe on because the weight is way out front and I can imagine things would get hairy real quick without some good ballast. Thanks Bxpanded! Worked as advertised. Great customer service. 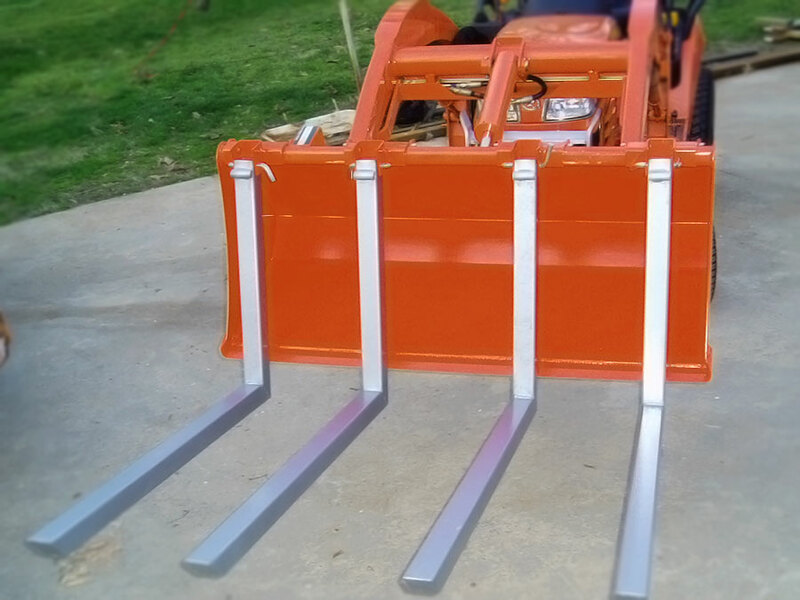 Ordered 5' snowplow after seeing quality of forks. 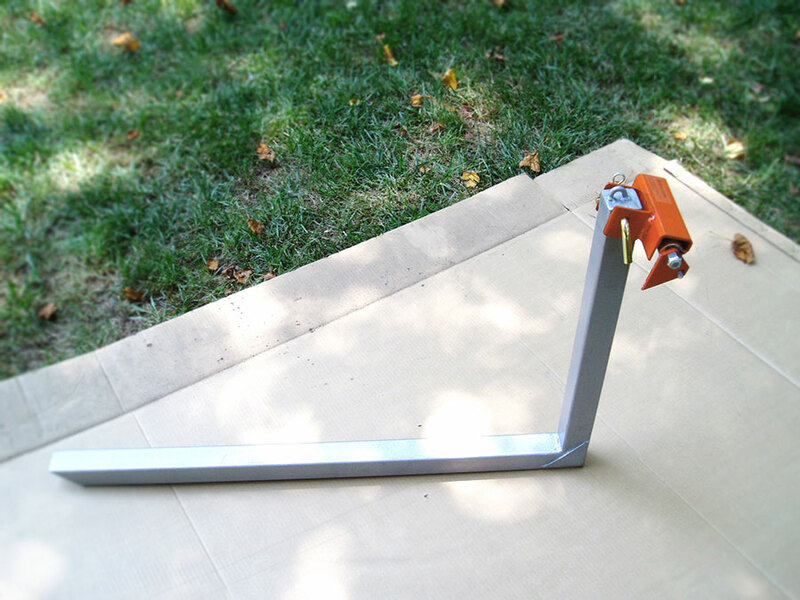 This forks attach very quickly and work well for moving items that don't fit into the bucket. They do move the load further away from the tractor so you have to be careful of the weight. These are well made like all 8 of the BXpanded items my BX has. I ordered a pair of these forks in March of this year, and I've used them continuously for hauling logs, brush, lawn equipment and furniture, etc. They are unbelievable and attach and remove in seconds. After hurricane Irene hit this past summer I used them to load brush and tree branches into my trailer for several dump runs. It normally would have taken me a several weekends to clean up a mess like that, but I was able to do it all on a Saturday. One of the best additions to my new Kubota so far. Thanks Harry. Talk about good service. Had some problems getting the bucket clamps and pallet fork clamps to fit over the lip edge of bucket. Harry advised me to use a little DISH SOAP and it did the trick! Talk about personal service? It dosnt get any better than that!. Was able to carry heavy 200# steel wood burner out to scrap pile finally. Lifted 400 # wood splitter onto a truck with ease. Am planning to use pallet with sides to haul firewood to the house in the winter. I can now haul 3 X the amount of wood in one trip! Thanks Harry! Incredibly simple to install the brackets, and the forks install with a pin and clip. First use was to move a pile of packed grass clippings onto my trailer. Worked as I figured they would. Took the forks off and left the brackets on for future use. 1 minute install. Watch the video. It's just that easy. Thanks to Harry for another well thought out design! Q: I installed your Piranha attachment on my BX25D. Will the BX pallet fork work with the Piranha attachment? A: Yes, the will so long as you purchased the Piranha for the BX series tractors. They have the cut out on each end for the fork to go into. Was this answer helpful? 18 of 18 Customer(s) found this Answer helpful. Q: I have a set of these, there Great, I was wanting to know what gauge steel they are? A: There are several different materials and thicknesses used to construct the forks, much design work has gone into them. They are designed to be as light as possible at about 42 lbs for a complete pair allowing the tractor to pick up more than other forks while offering enough strength to easily exceed the lifting capacity of the tractor. Every pound you have in fork weight means one less pound you can move!